Marlene Obermayer (MO): How did you come up with the idea to make an exhibition on publishing? Luca Lo Pinto (LLP): For me, publishing is a big box, in the sense that it’s a toolbox, an instrument, a vehicle that artists use in very different ways. Moreover, the topic, of course, is huge. That’s why, even if the title (as I’m always repeating) is very heavy and sounds almost encyclopedic, the exhibition tries to achieve the opposite. This is important, because I didn’t want to sound arrogant – in terms of the exhibition. But doing it in a humble, modest way, just to present a number of positions and possibilities and to share them with an audience, which might not interested in the topic per se: that is already a big challenge. MO: Do you have your own definition of what an artists’ publication can be? LLP: Honestly, I don’t have a definition. For example, Laura Owens’ last exhibition catalogue at the Whitney was produced in 1000 copies. Each cover of this edition is unique and hand screen printed by the artist. What is this? An artists’ book? Or just a catalogue with a special cover? For me, the main interest was to show and share my amazement how artists can use this tool in different ways over and over again. Therefore, it was not and is not only about art. It’s not a closed and self-referential discourse. In the first section of the exhibition, the Artists’ Library, I was more interested in what artists see in other authors. What are their references? More in the sense of artistic practice, of thinking and production, of a book that has been influential or inspiring for them. And that’s why I wanted to leave the choice very open. MO: Instead of a conventional exhibition catalogue, you decided to make a journal, which in my opinion is inseparable from the exhibition itself. You can learn a lot about the participating artists. At home, I looked at the journal, read it and googled some books I didn’t know… and the exhibition continues at home. LLP: Yeah, for me the texts are essential for different reasons, because when you read the text, you can discover some books that you didn’t know. That’s maybe the case for 60% or even more, they’re not really about art and not even artists’ books. They’re about philosophy or anything… That is already interesting, because it means something. And you can also get to know the artist from another perspective. I think this is the opposite of being nerdy. For someone who doesn’t know Heimo Zobernig, for example, even if his text is just one sentence [I like thick books with much content. ], you can get his sense of irony. Julie Ault’s text is the opposite, it is very long. The other reason why we made this journal is that it provides a lot of information to the public… As you see, the exhibition is divided into eleven chapters. Each one has a title, a description, so everything is there. For this exhibition, it’s very important to present all the tools to the visitors to get in touch with what they see. I knew from the beginning that it wouldn’t be possible to do an exhibition where all the publications could be read or flipped through, which is the first big problem when you start thinking about it. MO: That’s the problem with historical exhibitions about artists’ books: the books are like relicts in a glass display. LLP: Yeah, exactly, like in a mausoleum. 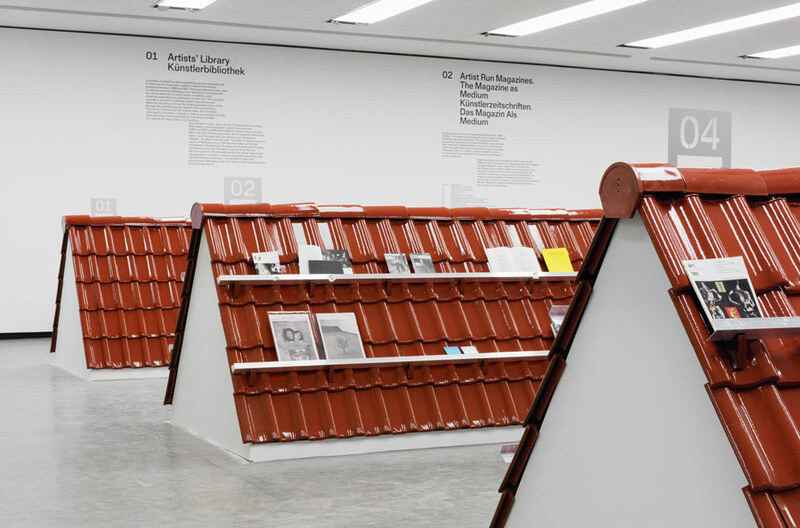 That’s the reason why I wanted to have a kind of curated bookshop within the exhibition. I wanted to have everything on the same level. Some chapters are just discursive chapters – round table events, because some things work better if you just talk about them. We were talking about the first section. Maybe you don’t have the time to see everything, but you might start to read the text by the artist, discover a book and say: wow, the way this person talks or writes makes me curious to read the book. This excites me. The same applies for the magazines; you have a kind of research on that topic, too. Further on, you know, publishing a magazine is not publishing a book. It’s another tool with totally different kinds of procedures and protocols. Some sections are sort of exhibitions within the exhibition. I really didn’t want to design something only for those who are already into it, only for nerds. MO: The chapter In Between at the former studio of Franz West is outside of the Kunsthalle Wien exhibition space. Can you tell me more about it? LLP: It was important for me to leave the exhibition space and work in a different kind of environment, to present the library as a portrait. It could be the portrait of a person or even of a state – via the Austrian National Library in the end, you would get a kind of a portrait of Austria and the city of Vienna. At the very beginning, I thought of the Austrian National Library or the Vienna City Library and about inviting artists to do what they did in the Franz West library. But then I thought that there are so many libraries that it’s crazy for an artist to react and choose one book out of millions. And by chance, through the former assistant of Franz West, I heard about his studio and the small library in Annagasse (1010 Vienna). We invited a number of artists to choose a book from this library and to create an intervention in form of an insert that is placed between the pages of the chosen book. The books, though, are not placed in a specific way; you have to find them. Basically, you will have the same experience that the artists and I had. You have to look through all the books – that’s the important part for me. MO: So the interventions in the books serve as the statement itself? A stimulating interview. Thanks. Is the longer version available for reading?